packing for travel, travel planning, what to pack for two weeks in England. I really wish I could take credit for that post title, but I have to admit it comes from a comment D.A. Wolfe left on my last post. D.A. writes the blog Daily Plate of Crazy. I’ve been reading her work ever since I saw a guest post she wrote a few years ago on Tish Jett’s blog A Femme d’un Certain Age. And we’ve kind of been bloggy friends ever since she asked me to be part of the Midlife Makeover series on her blog. That was fun. And so kind of her to include me. Anyhoo, if you remember last time we talked, I whined about not feeling the love for planning and packing, and you listened. Or read, as the case may be. After my initial “meh” moment, and then my ensuing post, I did manage to get some planning done. I pulled everything that I might want to pack to take to England out of my closet and drawers, piled it all on the bed in my spare room, wrote all the items down in my journal. And gave up. I usually make two lists when I plan my outfits for travel. One list includes the individual items, and one puts the individual items together into outfits for different activities. This year I organized my first list into four columns: tops, bottoms, jackets or toppers, and shoes. When I finally got my second planning wind, a day or so after my last post, I had at least made a start on the first list. I had written down all the items that were “possibles.” Then came the part that defeated me earlier in the week. The trying on, mixing and matching, selecting and eliminating, and adding new pieces that would be necessary to make the others work together. Sue over at Une Femme d’Un Certain Âge says that she always starts her outfit planning with shoes. This is really good advice, especially if you have a large shoe closet with many options from which to choose, or if you’re tempted to pack uncomfortable footwear. But for me the choice of shoes is not a difficult one. I don’t have a lot of shoes, so I’m not spoiled for choice. Twenty-four pairs in total, including winter boots, summer sandals, and several pairs of pumps and flats that I haven’t worn in years but can’t bring myself to give away. I know because I counted them when I was writing a post on shoes last year. And I tend to travel with the same three or four pairs every trip. For this trip I’ll be taking pretty much the same footwear that I packed for France in 2015 (adding ankle boots, and eliminating sandals), and for South America earlier this year (eliminating sandals, and exchanging my Stuart Weitzman ankle boots for my hiking boots.) So with my shoe choices pretty much made for me, I started my planning by choosing jackets or toppers. Then I looked at possible bottoms. Then finally I picked tops that will go with the rest of the outfit, dictated by the activity or the weather. I’m still thinking. I may add a light turtleneck to these. Then I commenced trying on. I would need outfits for travel (by plane and by train.) Outfits for daywear in cities and towns (shopping, sightseeing, and sipping tea in Fortnum and Mason.) And, I decided, three outfits for evening (dinner or the theatre) when I might want to look a bit smarter. I planned for cool weather, rain, and possibly a few days of warmer temperatures. As you can see from my notes, I eliminated three possible tops from my initial list, one sweater, and two pairs of jeans. I added in my black, light wool leggings to wear on the plane, one long-sleeved tee for wearing on the plane and for “lounging” around our hotel rooms, and two scarves. If an outfit met with my approval once I’d tried it on, I noted it on my outfit list. Black and blue and white is my colour scheme, it appears. So. Here’s what I’m packing. 8 tops. Including 2 short-sleeved tees, 2 long-sleeved tees, 1 white shirt, 2 sweat shirts (1 is very lightweight), and 1 light turtleneck. 4 bottoms. 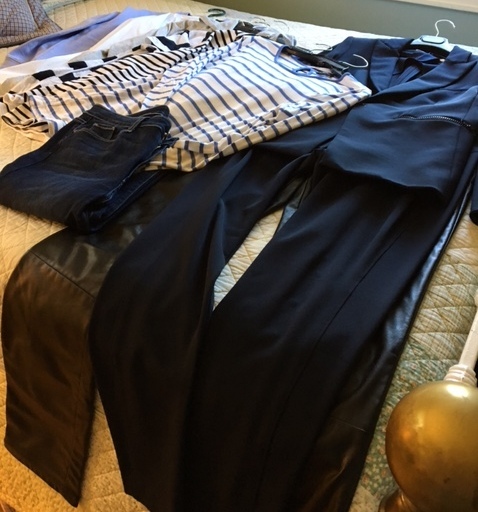 Including two pairs of jeans, my Veronica Beard cropped pants which are part of my suit, and my leather trousers. 2 jackets/coats. Including my navy Veronica Beard suit jacket, and my Michael Kors raincoat. 2 pairs of shoes. Including my Stan Smith Adidas sneakers, and my Stuart Weitzman loafers. Ha. Seems like I never travel anywhere without Stuart and Stan. 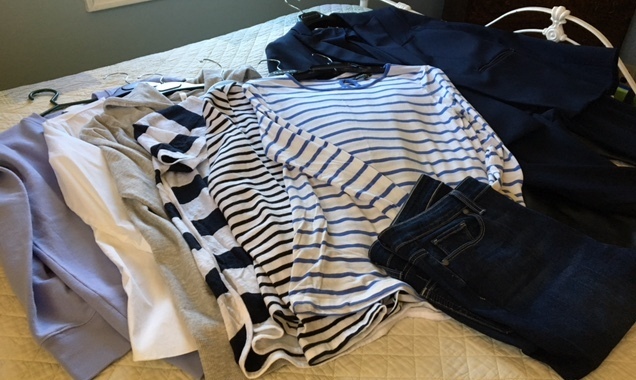 I’ve also packed 2 scarves, a couple of white camis, my ski underwear (for lounging in the hotel or under jeans, if the weather is cold and rainy), nightwear, and underwear. And a light pair of running gloves. Just in case. As I said to Elizabeth the other day, Hubby and I have been in some pretty cold and miserable, rainy days even when it’s 22° C. Those gloves and ski underwear may come in handy. On the plane I plan to wear my black Vince leggings, a loose, long-sleeved white tee shirt, my new Lafayette zippered sweater with the quilted front (bought at the Nordstrom Anniversary sale for just this purpose), and my Stuart Weitzman ankle boots. My Gortex rain jacket will be in my knapsack. I debated whether to bring my Michael Kors rain coat, or my Gortex jacket. Or both. And decided on both. One is waterproof and strictly for foul weather days. The other is not quite so waterproof, but looks nicer, is longer over a suit jacket, and packs up tightly in its own little carrying case. So that’s it. Sounds like a lot for two and a half weeks, doesn’t it? Or does it? Will I be able to fit it all in my little carry-on sized spinner suitcase and a knapsack? Well, let’s see. I just checked my planning lists for our six-week South America trip. I packed: 3 pairs of footwear, 12 tops, 6 bottoms, 3 jackets + cosmetics + swimming gear + a ginormous first-aid kit + miscellaneous extras… into my small spinner bag, and the matching tote. I should be okay. I’ve been travelling with the small spinner bag, and the matching tote that sits on top, every trip for the past few years. South America, France, numerous trips down east. And it’s been fine. But I won’t be taking them this trip. I learned my lesson when Elizabeth and I went to Toronto in June. Since it was a lovely, sunny day, we decided to walk the ten blocks or so from the train station to our accommodation. As we navigated the streets of Toronto, I realized that the tote bag on top of the suitcase makes the whole package top heavy. It kept tipping over, and twisting in my hand. And by the time I wheeled that sucker up and down curbs, across cobblestones, and over tram tracks… I was thoroughly fed up. Oh, it’s fine for zipping along smooth-floored airports, and then loading into a cab or a rental car… but not fine for navigating city streets. Elizabeth and I will be taking trains everywhere in England, and presumably pulling our bags a few blocks to hotels or subways. So, I’ll bring my small spinner suitcase, but I’ve abandoned the tote bag for a well-designed knapsack of Hubby’s. Besides the knapsack is much easier to carry, better for the old back. And the old back is my priority today. I tweaked something (again) yesterday morning. Cold temperatures, stiff muscles, too much sitting, reaching down into the deep-freeze to retrieve a casserole for dinner… you know, the usual. So I’m taking it easy, stretching, taking anti-inflammatories, going for one more physio tomorrow, and holding my breath. Hoping it won’t interfere with my trip. Sigh. Guess I should say I’m plagued by… first world back problems. Ha. The next time you hear from me I’ll be on the other side of the Atlantic. Seems like such a long time ago that Elizabeth and I finalized all our plans. So much water under the bridge that it’s hard to believe the day is almost here. And since I’ve finished my packing, I guess I’ll just focus on keeping calm. Better put the kettle on in that case, eh? What about you my friends? And trip planning advice to share? How do you spend the time between being all ready to go and the actual going? My back is somewhat better. More physio tomorrow since our flight doesn't leave until late evening. Then an anti-inflammatory pill on the plane. I should be good. I'd love to visit Vienna. I didn't realize that Advent was a popular time to travel there. Thanks, Leslie. I'll bet you had to be able to travel at the last minute in your former career. Or else have a permanent bag packed. world , think we know where you're coming from! I'm on holiday and this time I allowed myself the luxury of a day gap between suitcase zipped and on plane. Don't think that's helped. I could have squeezed in an extra long sleeved top because I tend to be wearing just one layer under my Uniqlo. You seem to have cleverly packed enough. I'm visiting a little island in the UK. We arrived during the tail end of Hurricane Maria, so had a hair-raising landing. You're lucky, that's now blown away, so your case should fit the finer weather. Don't think you'll be wearing ski underwear anywhere but lounging indoors, it's only cold enough for that layering over here when playing golf in middle of winter. Bon voyage (the English really don't have their own snappy for that other than speed thee well!). Hugs, x.
Ha. Hoped someone might make that connection:) The ski underwear will be good for lounging, if for nothing else. It's also lighter and packs easier than sweat pants or leggings. Hope your island stay has been a good one! I feel I should be offering you wise advice on what to bring here but our weather never stays the same for long . Even I get caught out sometimes & end up lugging a jacket round on a day that turns out surprisingly warm . The two waterproofs , one practical the other dressy , are a good idea especially when one of them takes up little space . Also the ski underwear – just for insurance . I tend to take just one dressy evening outfit but that's because I'm usually too worn out after busy days to manage much nightlife – boring I know . It's a shame your back is playing up , would an inflatable cushion for support on planes & trains be any help ? I'm sure we will all enjoy your travel tales . Have a safe journey . I should say that the only specific "evening" attire piece are my leather pants. Everything else that I'll wear at night is dual purpose. I can wear my VB pants with a blouse during the day if we get a warm one, and the jacket is good for day…then combine them into the suit for going out to dinner. Great that you and Sue are going to meet up. Oh… I hear you. When I had a smooth bob, I had to pack so much hair equipment and product! I always travel in black and in sensible shoes. Black so that it doesn't matter if I drop stuff down me – cup of tea this time… – and sensible shoes so I can run should danger strike. I always start my list with jeans, then move to shirts and tops. Scarves at least two, for plane and for cover ups, one quite basic, one quite smart. And now I roll stuff, rather than fold. It works. BTW: bring hat, waterproof jacket and boots. It is now quite windy and rainy up in the north here but not particularly cold. My packing sounds similar to yours. I'm so used to packing for hiking and camping trips that I pack rain gear as a matter of course. I used packing cubes for the first time for our South America trip last winter. They are good for organizing things, and do pack stuff quite densely, but I found them of limited value. The large one held almost all my clothes, with few items left to pack in the crevices around it or to stuff in shoes etc. They may be better for big suitcases when things can get disorganized in transit. This trip, I am using a small one for a few items to place in my carry-on knapsack. Another small one for my underwear etc in my spinner bag, but I find I can pack more tightly and efficiently it I roll items, or fold and smooth, then fold again, until very small. I will say that the packing cubes came in handy when we traveled from one climate to another. Last winter after we left Buenos Aires, I put all our hot weather stuff in a cube and left it untouched until a couple of weeks while we were in Patagonia. I'm travelling with carry-on size luggage but I'm checking the spinner bag. I don't want to be struggling with it on the plane, and look like an idiot if I can't lift it into the overhead compartment. I think if we fly carry-on we should be able to heft our own bags. Otherwise check it. Thanks, Suz. Hoping that all beds in England are hard! I have to admire your well thought out packing. I shall be travelling by car later this week when I shall be packing for all contingencies!! Hope your back improves and that you have a wonderful trip. When we travel by car…all bets are off. No holding back! I really like the idea of starting with shoes. Usually I start with pants. Not sure why. Am planing a trip later this month and will try "Shoes first!" Hope the "shoes first" plan works for you, Ann. Have a wonderful trip. I look forward to your holiday stories. Have a fabulous time! I look forward to hearing all about it! All my flights for the last several years have included my little dog in a carry on case under the seat, so my days of traveling without checking a bag seem to be over. You must be an ace packer, lots of stuff in small spaces! Lots of stuff in small spaces for sure. My bags are always small but dense! As a fellow retired English teacher, I enjoy your blog and reading tips. Your travel packing strategy sounds good, but I wonder if you considered throwing in a wool sweater or light weight packable down vest. Nights in October in England and Europe can be chilly, but then again, it might be more fun to buy something there if you need it. Safe travels. Great post Sue! 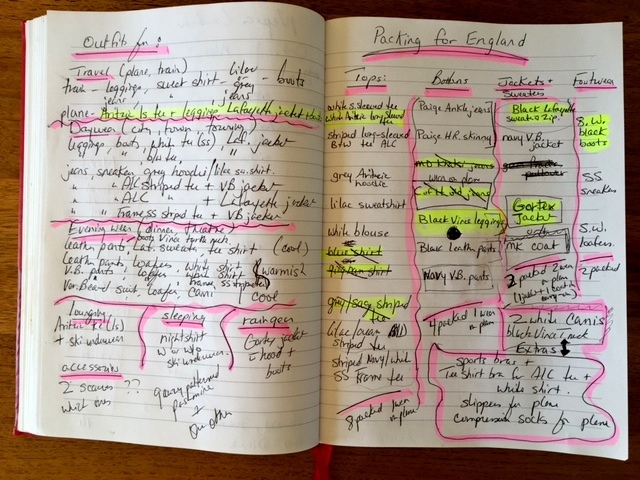 I really like the layout of your packing list …think I'll try your way … mines always simply a "list" and it's not even on paper for my travels next week , just thoughts in my head! :) My case is closed the evening before we set off. Usually with something extra popped in as it stands by the front door! :) Year by year I manage to pack less but I probably still over pack … although recently I've made a list each time we travel of what I actually wore, what worked well etc. Then I refer back to that when I'm packing for a similar destination/length of time. I hope your backs feeling less tense/stiff and painful today and that you're able to feel comfortable on the plane. Take care, safe travels … have fun! As Wendy said, it'll be good to see you soon! Thanks, Rosie. I'm also bringing as cross body purse…albeit not a small one… for things I'm not comfortable putting on my back where I can't see them. ps I agree a knapsack's such a good choice! I use a backpack a lot. So much better for your back. Sometimes i'll also use a small crossbody bag that will fit inside the backpack but is handy to wear at the airport so that passport travel documents phone etc are easily accessible. Meanwhile, I'm glad you mentioned Tish as well – talk about keep calm and keep packing! I was delighted when I packed (little) and traveled (big) to meet up with her in Paris two years ago. 'Twas so much fun! Meanwhile… I love your positive packing prowess — simply splendidly smart! Have a wonderful trip Sue and Elizabeth! May Mother Nature shine on your adventures. I'm trying to change my packing habits. I mess up in the shoe department!! 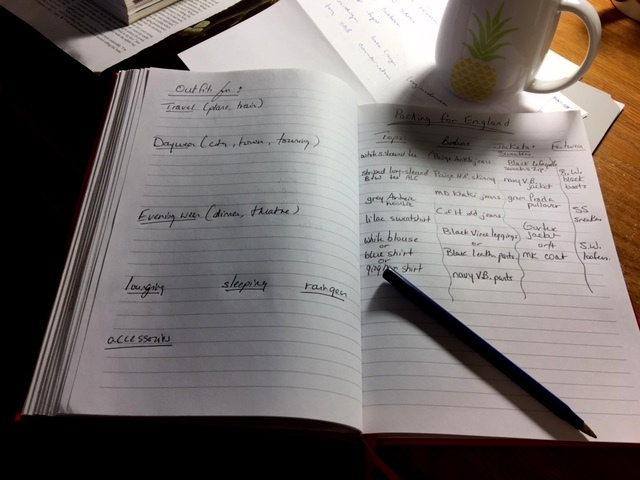 I love your lists and admire how much thought goes into your planning. I'm a visual person. I was wondering if "outfit of the day" pictures would be possible. That sounds like very practical packing at its best, Susan and I don't have anything else to suggest you take ( maybe a lightweight sweater, vest or another skivvy at the most ). Bon voyage and good luck with your back ! Perfect timing! I head to the UK in 2 weeks. I start planning with shoes as well. Then outerwear, as these ensure the most comfort. I like the ideas of writing down outfit ideas, then trying them on. Sometimes they look better in my head! I love, love the idea of adding the leather pants. More shopping to do!